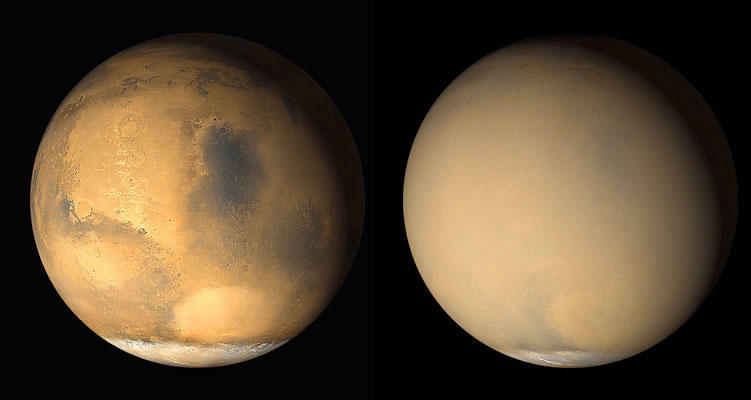 A before and after photo from a global dust storm in 2001 shows the progression of the Mars dust storm. This summer Mars has been closer to Earth than at any time since 2003, which has made it prime time for viewing the Red Planet. But if you have viewed Mars through a telescope recently, you may have been disappointed to find that details on the planet were blurry. Before you check your vision, you should know it’s not you, it’s Mars. A global dust storm has been raging since early June and has made seeing details a little fuzzy. Regional dust storms on Mars are fairly commonplace: however, a global storm happens rarely. Not only has the storm limited viewing here on Earth, it has complicated Martian exploration missions. The last global storm was in 2007, and caused the two solar-powered rovers on Mars, Opportunity and Spirit, to shut down for several weeks, removing the rovers’ ability to send data to Earth. Flash forward to 2018; Opportunity remains active on the planet but with a new, nuclear-powered partner, Curiosity. The hearty Opportunity is hibernating for the second time in order to survive, while Curiosity’s nuclear-powered batteries allow it to proceed, business as usual, even while being pelted by Martian dust. The storm has faded as we continue through August, but we have yet to hear from the Opportunity rover. The Curiosity rover’s collection of data during the storm may give us clues into questions that scientists have about the nature of storms on Mars, including why some storms are only regional, while others develop into global phenomena like the one happening now. The Mars rovers have survived for quite some time on the planet - longer than scientists expected. This raises a few questions. How long can humans survive on Mars? How can we prepare spacecraft for these storms? What kind of consequences would a storm like this have on human colonization on Mars? These questions, and countless others, continue to be asked by the likes of NASA, SpaceX, and many more, as the push for Mars exploration and colonization continues. Western Slope Skies is produced by the Black Canyon Astronomical Society. This episode was written and recorded by Park Ranger Julianne Renner of Black Canyon of the Gunnison National Park.